A year after unidentified snipers gunned down dozens of protesters and police officers in central Kiev, the post-coup government rejects evidence that alleges protester involvement in the crimes, which paved the way to regime change in Ukraine. During last year’s clashes between Ukrainian anti-government protesters and riot police some 20 police officers and over 100 protesters – now revered as ‘the heavenly hundred’ in Ukraine – were killed. The majority were victims of the February 20, 2014, incident in which unidentified snipers started shooting on both sides of Independence Square and the adjacent Instituskaya Street. The mass killings were the tipping point of the 2014 Maidan protest, escalating the already violent confrontation into an armed coup. The current Ukrainian government, which came to power after an election in the wake of the violence, accused three police officers of being behind the majority of the killings. Mainstream Western media have been supportive of that narrative, saying the ousted President Viktor Yanukovich or someone in his security forces gave the order to fire live ammo at the protesters to suppress the riots. Yet evidence, both available from the very beginning and emerging later, points to another version – that the killings were triggered by armed radicals among the protesters. Even as petrol bombs were thrown at police ranks, proponents of the Maidan protest depicted the confrontation as a stand-off between heavily-armed security troops and self-defense activists armed with nothing more than homemade armor and sticks. Yet the protesters had access to firearms and they used them on February 20. “A lot of lads came to us then, who said we should take up arms and attack… Many had guns with them, often hunting rifles,” Vladimir Parasyuk, then-leader of one of the Maidan’s paramilitary units, said in an interview with Frankfurter Allgemeine Zeitung (FAZ) published last week. Parasyuk, who is now an MP and a commander of one of Kiev’s notorious volunteer battalions, became famous a day after the massacre. From the stage at Maidan Square he rejected an EU-brokered truce signed hours earlier by President Yanukovich and three leaders of the protest and pledged to a cheering crowd that he would take his men and assault the presidential residence the next morning. The Yanukovich, by that time abandoned by his defenders, fled. The protesters had sniper positions at buildings surrounding the square, as evidenced by a recent BBC report. The British channel spoke to one of the snipers, a man called Sergey to protect his true identity, who said he was shooting into the square from the Conservatory building. The fact that at least sniper fire came from the protester-controlled position is hardly a secret. In fact, warnings of sniper fire from Hotel Ukraina and other buildings were announced right from the Maidan stage amid the confrontation. The protest leaders however were quick to blame Yanukovich for the shootings and seize power. Meanwhile awkward questions about weapons at Maidan and their possible connection to opposition figures started surfacing even before the tragic events. On February 18, a group of activists detained a masked man trying to leave Institutskaya Street in a car. A search produced an M4 carbine-based hunter rifle – complete with a scope and a silencer – stashed in the trunk. The man was rescued by Sergey Pashinsky, a then-opposition MP, who popped up at the scene and drove the car away. 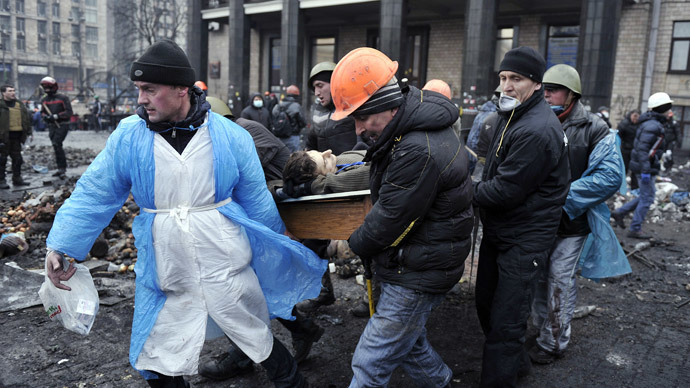 The Ukrainian authorities later said they found no link between the episode and any crimes. A detailed study of the Kiev massacre was done by Ivan Katchanovski, a Canadian scholar of western-Ukrainian descent, at Ottawa University. The paper based on various publicly-available materials, including photos and footage from the Maidan, media reports, hours of intercepted radio communications between Ukrainian special units, and an on-site inspection by the author. At the time of the massacre the Maidan protesters had plenty of Kalashnikov assault rifles and other lethal weapons, the paper says, citing photo and video evidence. Its source, according to a parliamentary investigation into the massacre, could be police arsenals looted over previous days in western Ukraine, where over 1,000 pieces had been stolen between February 18 and 19. Katchanovski argues that radical elements among the protesters deliberately killed both anti-government activists and police officers to escalate the tension, while protest leaders obstructed attempts by the police to curb down the violence. That conclusion is apparently not welcomed in Ukraine. The Ukrainian authorities raided Katchanovski’s home after the publication, he told the German Telepolis Magazine in an interview. A police investigation conducted by the new authorities managed to produce several suspects, all of them Berkut riot police members, who are currently being prosecuted in Ukraine. The evidence incriminating them has never been made public, with Reuters reporting that the investigation process was flawed. The head of an MP committee probing the mass killings mentioned “unidentified public organizations” as possible culprits, but no formal prosecution of any other individual has been conducted.